The Country Foods of Gascony. The lusy cuisine of this ancient French province is guaranteed to warm you, body and soul. The ancient region of Gascony, located south of Bordeaux, with the Atlantic Ocean to the west and the Garonne River to the east, has not yet been hit with the sort of culture-pounding tourism found elsewhere in France. As yet, no enterprising writer has done for it what Peter Mayle did for Provence. Most Americans, if they know Gascony at all, know it for the prehistoric cave drawings of Les Eyzies and Lascaux, or perhaps as a prime source of foie gras or Armagnac. This historic province, which in modern times has been divided into several French departements, is still dotted with picturesque castles, forts, churches and villages, still a rural area with a slow economy. This foodcentric view of life is not surprising coming from Daguin, who, at 44, is the youngest member of a culinary dynasty that has been cooking the food of Gascony for 250 years. The chef and restaurateur has followed in the footsteps of her father, André, the last in a long line of Daguins to preside over the kitchen of the Hotel de France in the city of Auch. Members of the Daguin family had cooked at the hotel since 1764; they became owners in the 1930s and remained in charge until André Daguin retired and sold the place in 1997. Meanwhile, however, Ariane Daguin has been sharing the delights of Gascon food with diners in the United States. In 1985, she plunged into the American food world with D’Artagnan, a wholesale-retail purveyor of fresh foie gras and other specialty goods. In February 2001, she opened a New York restaurant, D’Artagnan—The Rotisserie. “The foods I like best are those of my roots,” says Daguin. Those foods are at once robust and luxurious. Gascon cuisine employs a limited but sumptuous roster of ingredients such as Moulard duck, game birds, duck and goose foie gras, Roquefort cheeses nurtured in the sinuses of windy caves, prunes soaked in Armagnac, tangy quinces and regional wines that range from rustic to ravishing (and which are generally reasonable in price). 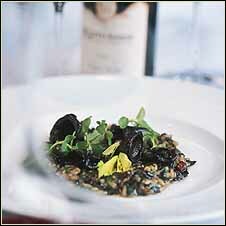 Gascon specialties tend to be earthy and filling. They lend themselves well to the bistro culture, and many are menu perennials, like cassoulet and duck leg confit (duck leg preserved in rendered duck fat, with succulent, flavorful results). Duck and goose fats, the region’s principal cooking fats, lend their rich flavor to many dishes. Hams and sausages of various kinds are prized; ventreche, a salted pork-belly product similar to Italian pancetta, is used as a flavoring. Garlic and parsley are favorite seasonings, as is black pepper and a spice mixture called quatre épices, or four spices (which often contains five spices: pepper, clove, nutmeg, cinnamon and ginger). Cêpes (porcini) and other wild fungi are eaten with relish. Although the region is better known for Armagnac, its distinctive local brandy, the Gascons weave wine throughout their cuisine, both as a beverage and cooking ingredient. Gascony lies in southwestern France, south of Bordeaux, and shares much the same weather patterns. A good year for Bordeaux is usually a good year for Gascon wine as well; many Gascon reds need to age at least five years. The wines range from flowery white Mansengs (Gros and Petit), rustic reds made from the indigenous Tannat grape and various blends made from the same varieties as in neighboring Bordeaux. Tannat’s intense tannins perfectly counterbalance the fat in Gascon recipes, and the food never ends up tasting greasy. Daguin named her company for 17th-century Gascon homeboy, fourth musketeer Charles de Batz de Castelmore (aka d’Artagnan) and her restaurant bears the same name. Chef Marc Eymin, 31, works in full view of the diners in the restaurant’s open kitchen on the ground floor. “It was always my plan to someday open a restaurant,” Daguin continues, “but the wholesale business put that on the back burner for 15 years.” A French investor group approached her to open a foie gras bar, but she modified the concept to accommodate the tastes of her youth. Today, what she serves in her restaurant is what she learned in her father’s kitchen, at one time the bearer of two Michelin stars: It’s all about prime ingredients employed in authentic Gascon family recipes. By being both the supplier and end-user of most of her ingredients, Daguin has been able to ensure that authenticity. The Moulard duck was the foundation upon which Daguin’s retail business was conceived, and it is the key to much of the Gascon cuisine. The Moulard is the sterile offspring of a female Pekin and male Muscovy duck. It has the thoracic capacity for the force-feeding that makes the liver so rich and a large breast with a wonderfully beefy taste. The breast (magret) of a Moulard duck is chewy, like steak, giving Magret with Quince Sauce a heartier texture than most restaurant duck preparations. The first time I ate at D’Artagnan, I melted like a morsel of goose fat in a hot skillet. The dishes are prepared the Gascon way, with duck, onions, garlic—lots of garlic—strong wine and stronger brandy. It is blatantly rich and supersavory, the kind of vittles one craves in chilly weather. Meals at D’Artagnan are awash in spirits, and diners often start with one of their kooky but tasty cocktails, like the D’Artagnan (Blanche d’Armagnac, prune liqueur, Floc de Gascogne—Floc is a sweet, unfermented aperitif wine with an Armagnac base, sort of the equivalent of Cognac’s Pineau des Charentes), or the Gascon classic Pousse Rapiere (orange liqueur, sparkling water). Magret is a D’Artagnan entrée staple. First served by her father in 1959, the meat is aged seven days and served rare with a sauce, like a sweet-tart quince purée. Other dishes are a wickedly good duck confit and quail stuffed with fat prunes. The quail is flavorful and moist, and the prunes are soft as a lump of warm butter, drowned in fiery Armagnac. At the end of a D’Artagnan meal, general manager Eric Bonnetain comes round with a lethal bottle of Blanche de Gascogne (a clear eau-de-vie, hot tasting and straight from the still) in one hand and shot glasses in the other—the shot glasses have rounded stems and no bases so that they can’t be put down. In Gascony, white Armagnac is sometimes served between courses. Daguin unabashedly calls this practice “the hole in the stomach,” as it supposedly aids in digestion and creates more room for further eating. But to end a meal, most Gascons drink one of the great aged Armagnacs, like the reasonably priced Saint Aubin NV, which is aged in casks for the time it takes to travel around the world in a boat, or Château Laubade VSOP, which is more of an archetypal Armagnac. There are nine key appellations d’origine controlée (AOCs) in Gascony. Madiran encompasses the area around the village of Madiran, in the foothills of the Pyrenees south of Armagnac. Madiran produces only red wines, primarily from the rustic Tannat grape, which is tannic and earthy, and built for duck dishes. Two D’Artagnan favorites are Château Bouscassé and Château Montus, both made of 100 percent Tannat. Sometimes Tannat is blended with Cabernet Sauvignon or Cabernet Franc to soften it. White wines in the area are labeled Pacherenc du Vic Bilh. Gros and Petit Manseng produce a juicy, spicy wine that is excellent with foie gras. Jurançon, also in the foothills around the town of Pau, produces only white wines; they are similar to those of Pacherenc du Vic Bilh, but more flowery. Varietals are Courbu, Gros Manseng and Petit Manseng. The wines are generally dry, but sweet if affected by Botrytis cinerea. With foie gras dishes, drink a golden-white Domaine du Tariquet—it’s kind of like a flowery Romandolo, without the fizz. With sweets, try a Château Jolys Moelleux. of Toulouse. The region is best known for a just-sweet sparkling wine called Gaillac Mousseux, which is one of the few sparklers made by the “rural method.” The grapes grown are Mauzac Blanc, L’el de L’el, Sauvignon Blanc and Sémillon; and it is often drunk as an apéritif. Buzet is next to Armagnac. It produces primarily robust, aromatic reds pressed from the grapes of the Bordeaux: Cabernet Sauvignon, Cabernet Franc, Merlot and Malbec for reds; Sémillon, Sauvignon Blanc and Muscadelle for whites. Indeed, the red wines are similar to good Bordeaux, but cheaper. Baron d’Ardeuil produces a Cabernet-Merlot blend that Daguin recommends for those who like red wine with their foie gras. Cahors, 120 miles east of Bordeaux, produces reds from mainly Malbec grapes blended with Tannat and Merlot. Called black wines, they are dark, tannic and long-lived, and pair beautifully with game. Alain Dominique Perrin’s Château Lagrezette is a reliabhle choice. Lesser appellations are to be found on lands that border Bordeaux; they grow the same grapes and produce wines of mainly local interest. the most delicate, fruity brandy comes from), Tenareze and Haut-Armagnac. First distilled as a medicine in the 13th century, Armagnac, a single-distillate (in contrast to Cognac, which is a double) is the oldest brandy in France. Four varieties of grapes are commonly used: Folle Blanche, Ugni Blanche, Colombard and Baco. When Folle Blanche is used in high percentage and aged for 15 years, it has fine texture and flowering fruit. But it’s hard to grow and sparsely employed. The hybrid Baco is the other star grape. Aged, it tastes like prunes and nuts; however, the AOC board has decided hybrids will no longer be allowed after 2010. But as most Armagnacs peak between 18 and 30 years, there should be plenty of product around. This wonderful soup of duck confit, cabbage and omelet is adapted from D’Artagnan’s Glorious Game Cookbook by Ariane Daguin, George Faison and Joanna Pruess (Little, Brown & Co., 1999) The recipe calls for a prosciutto rind, which can be found at many deli counters. It’s an optional ingredient, but worth trying, as it is considered an essential flavor in southwest France. You make your own duck confit with the recipe that follows this one or buy it in specialty markets. Wine recommendations: For the shot of red wine that goes into the garbure just before it is finished, Gascons like a 100 percent Tannat wine. A Malbec (also called Côt) from Cahors, with its fine tannic structure, is also a good match for the hearty, rich soup. To prepare duck stock: Preheat oven to 375F. Spread bones on a heavy baking sheet. Drizzle on fat, tossing to coat. Roast for 30 minutes, turning occasionally. Add onion, carrot and celery, turn to coat with fat and continue roasting until vegetables are richly browned but not scorched, approximately 25 minutes. Transfer bones and vegetables to a stockpot. Deglaze roasting pan by adding enough hot water to dissolve all browned bits and add resulting liquid to stockpot. Add salt and 2 quarts water or more if needed to cover bones. Bring to a boil, then reduce heat and simmer briskly, uncovered, for 45 minutes, skimming off any fat and impurities that rise to the surface. Add parsley, thyme, bay leaves, garlic and peppercorns. Simmer uncovered for 3 hours, adding hot water as necessary to keep bones and vegetables covered. Pour through a fine sieve into a pot or large bowl, pressing with a wooden spoon to extract as much liquid as possible. Discard solids and pour liquid through a strainer lined with several layers of dampened cheesecloth. If you have more than 2 quarts of stock, boil to reduce in volume to 2 quarts. Stock may be refrigerated for 3 to 4 days, or frozen for several weeks. Remove the solidified fat from the surface before reheating. To prepare garbure: Chop 6 cloves garlic. Heat 2 tablespoons duck fat in a large stockpot or Dutch set over medium-high heat. Add garlic, onions, celery, ventreche or pancetta and prosciutto rind and sauté for about 5 minutes or until tender. Pour in duck stock and bring to a boil. Reduce to a simmer. Meanwhile, beat eggs with sausage meat and parsley. Heat 2 more tablespoons duck fat in a large nonstick skillet set over medium heat. Pour in egg mixture and cook for about 10 minutes until golden brown. Slide omelet onto a large plate, cover it with a second plate and invert it, then slide it back into skillet. Cook the second side until brown, about 5 minutes. Slide omelet and duck legs confit into stock. Simmer for 30 minutes. Bring a large pot of salted water to a boil, add cabbage and cook for 5 minutes, then drain well. Heat 2 tablespoons duck fat in a saucepan. Add cabbage, turning to coat evenly, adding more fat if needed. Transfer cabbage and carrots to soup pot and cook for 30 minutes longer. Season to taste with salt and pepper. The recipe may be made ahead at this point and refrigerated for several days—it gets better as it sits. To make the garlic confit: Combine garlic and duck fat in a saucepan. Cook over medium heat for about 20 minutes, or until garlic is completely tender. Remove garlic with slotted spoon. To serve: Heat soup. Ten minutes before serving, add sliced gizzards and garlic confit. Remove prosciutto rind. Ladle garbure into warmed bowls, dividing duck, omelet and vegetables evenly. Serves 4. In Gascony, quince trees are traditionally planted as boundary markers. The quince was once highly regarded in the United States for preserve-making because of its high pectin content, and for the sweet-tart flavor it imparts to stews, but it is not so prevalent today. These days, you are most likely to find it in specialty markets. It is rather unsightly, with hard flesh that is impossible to eat raw. Prepare quince purée and sauce at least 1 hour before you cook the duck. Wine recommendation: A burly, tannic Madiran wine, of course, like the 1997 Château Montus. This is a really big wine that holds up well to the rich taste of the magret. Another good choice is Domaine Capmartin. To prepare the sauce: Heat 2 tablespoons sugar in a heavy saucepan set over medium heat until lightly caramelized. (Handle carefully, hot sugar can cause serious burns.) Stir in 1/2 cup vinegar and cook over high heat about 2 minutes, until reduced in volume by half. Add diced quince, stock and salt, and partially cover (placing pot lid so that steam can escape). Reduce heat to low; cook for 25 to 30 minutes, stirring occasionally, until fruit is tender. Purée in a blender or with a hand mixer until smooth. Return to pan and keep warm. Heat remaining 1 1 /2 tablespoons sugar in a small saucepan set over medium heat until lightly caramelized. Add the remaining 3 tablespoons vinegar and heat until reduced in volume by half. Add quince peelings and demi-glace. Cook sauce over low heat for 30 minutes, strain and keep warm. To cook the duck: Season the magret with salt and pepper. Heat a heavy skillet over medium-high heat. Place duck breast in pan, skin side down, without adding any fat. Cook for 8 minutes; checking to avoid burning. Remove fat as it accumulates. Flip breast over, reduce heat to medium and cook 4 minutes longer. Remove duck from heat and keep warm. To serve: Place a small amount of quince purée into the center of each of 4 warmed plates. Cut the duck breast in half, then cut it against the grain into 1/4-inch slices. Apportion slices evenly between the 4 plates, fanning them over the purée. Spoon a small amount of the sauce over them. Serves 4. It is important that you start this recipe three weeks before you plan to serve it, because Daguin says the prunes must soak for a minimum of 21 days. Just place 24 prunes in a sterilized, wide-mouth jar or crock and cover with Armagnac. Wine recommendations: A Fer Servadou, also known as Mansois or simply Fer. This is lighter on the tannin than other regional choices, which makes it a better partner for the delicate flavors of quail, but it still has enough power and peppery taste to hold up nicely next to those marvelous prunes. From the Marcillac region, choose a 1999 Jean Luc Matha or a 1998 Domaine du Cros; from Gaillac, the 2000 Château Lastour. To make the sauce: Heat a baking pan over medium heat. Add shallots, garlic confit and thyme and cook until the shallots wilt, about 5 minutes, scraping the any bits in the bottom of the pan all the while. Add veal and duck demi-glace and stir. Deglaze the skillet with the Armagnac and scrape any bits from the bottom of the pan. Reduce the heat and cook for about 1 hour, until the liquid becomes syrupy. Strain, taste and season with salt and pepper if necessary. Add grapes. To make the quail: Preheat oven to 475F to 500F. Season the quail inside and out with salt and freshly ground black pepper. Stuff the quail with 2 prunes each and close the cavity with a toothpick. Place quail in a baking pan and roast for 12 minutes. If they look dry, baste them with a little of the Armagnac/prune juice. To serve: Place a puddle of the sauce on each of 4 warm plates and place two quail on each. Serves 4. For more recipes, pick up the March issue of Wine Enthusiast at your local newsstand.